u‑blox has announced that Japan‑based Aerosense has commercialized its AEROBO Marker solution for drone surveying using the u‑blox NEO‑M8T timing module. Aerosense’s surveying solution is designed to reduce the time spent surveying construction sites. By combining ground markers equipped with a GNSS receiver with surveying drones and cloud‑based data processing, they have converted huge workloads into a user friendly application for anyone. 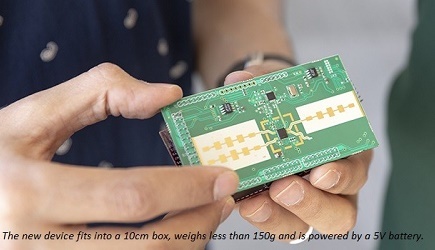 Conceived to compute absolute time to within 20 nanoseconds using incoming GNSS signals, the NEO‑M8T lets users access RAW GNSS data output, making it attractive for positioning applications that rely on post‑processing GNSS data to enhance location accuracy. The surveying operation on the site involves setting up ground markers fitted with u‑blox NEO‑M8T high performance GNSS receivers. The smart ground markers send the GNSS data they receive to the cloud, where it is post‑processed using a static surveying algorithm to achieve high accuracy. AEROBO’s solution can transform high‑resolution drone images into a survey‑accurate map by using the absolute geographic coordinates of specific points on the surveyed terrain. Images gathered by overflying the terrain with the drones are combined to create centimeter‑precise outputs, including orthomap views, 3D models, and point clouds.